Dr Andrew Wragg qualified from St Bartholomew’s Hospital Medical College in 1994 where he was awarded London University Honours Distinctions in all subjects. His postgraduate training in cardiology was based at Barts Health NHS Trust and the National Institutes of Health in America. Dr Wragg was appointed as a consultant in 2007. He works at The London Chest Hospital (Barts Health NHS Trust) as an interventional Cardiologist and at The Royal London Hospital (Barts Health NHS Trust) as a general Cardiologist. He is an Honorary Senior Lecturer at Queen Mary and Westfield College, London University. Dr Wragg runs the rapid access chest pain service at the London Chest Hospital and is also clinical lead for the Cardiac Rehabilitation service. 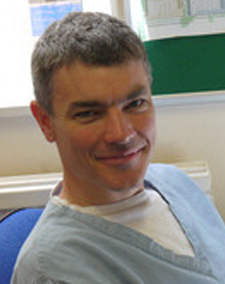 Dr Wragg is the Clinical Effectiveness lead for Bart’s Health Cardiovascular Clinical Academic Group. Dr Wragg manages patients with all types of cardiovascular problem but has specific expertise in managing patients with chest pain and related syndromes and also assessing and managing cardiovascular risk. Dr Wragg also is specialised in the assessment and management of patients with renal disease and cardiac concerns and problems. He also is interested in patients with, breathing problems, palpitations (an abnormal awareness of the heart beating) and high blood pressure. He performs coronary angiography and coronary stent procedures at the Heart Attack Centre at The London Chest Hospital, at The London Independent Hospital, Harley Street Clinic and at The Wellington Hospital. Dr Wragg is also interested in the diagnosis and management of patients with valvular heart disease. He is experienced at Trans Oesophageal Echocardiography. Dr Wragg was awarded a PhD by the University of London for research into stem cells undertaken at the National Institute of Health in the USA. Dr Wragg presently undertakes research into understanding the outcome of patients after they have had angioplasty procedures. He is also interested into better understanding the cardiac risks of non-cardiac surgery. He is also a member of the PROMS (http://www.nhs.uk/NHSEngland/thenhs/records/proms/Pages/aboutproms.aspx) steering group for cardiac revascularisation undertaking research into patient reported outcomes after angioplasty and cardiac surgery.